This week, we’ve been trying out some Mexican and Brazilian cookie recipes for an event on Saturday, 8/6. 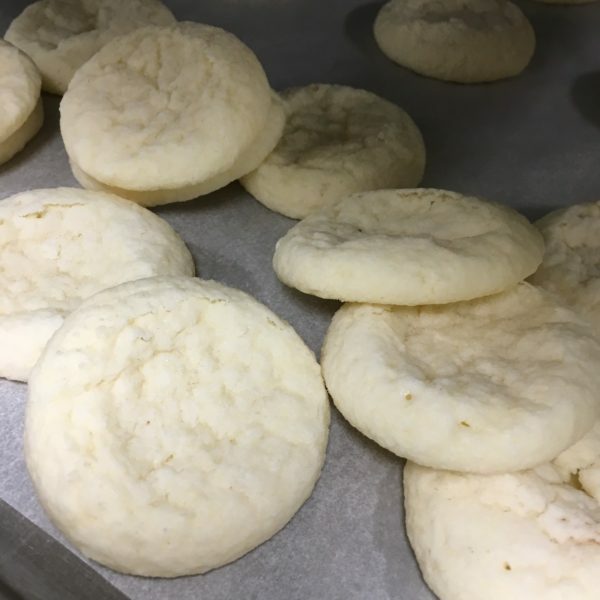 These traditional cornstarch cookies melt in your mouth! We actually ended up half dipping them in chocolate, which really brought the subtle flavor forward. Let’s hope for some beautiful final product photos from the event this weekend! There’s also going to be a particularly fun cake there, so expect some cool photos next week. This week was full of experiments, actually. We’re trying out some boozy fall recipes, so keep an eye out for some interesting things coming up next season! We were also excited to make some French macaroons for a long time customer of ours. These are ended up being so cute. That’s strawberry, orange and lemon filling in a traditional almond flavored cookie. 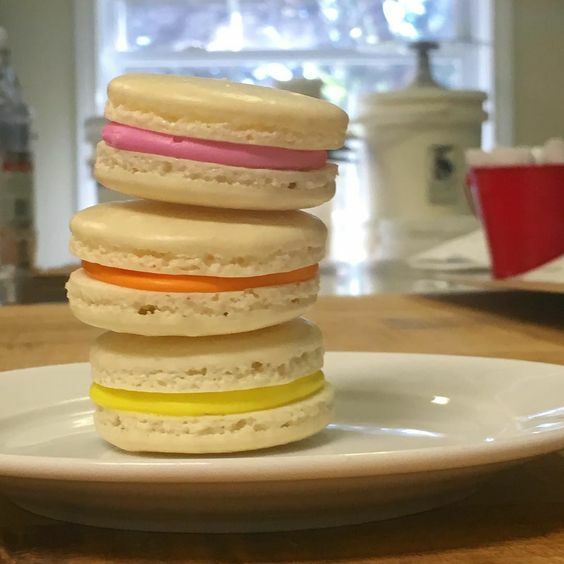 The French macaroons can be colored and flavored in a variety of ways. As all of you probably know, we are a fully custom bakery. Give us enough time and we can create anything! Something customers like to order is gift boxes! We did this one this week for baby McKenna Jo. 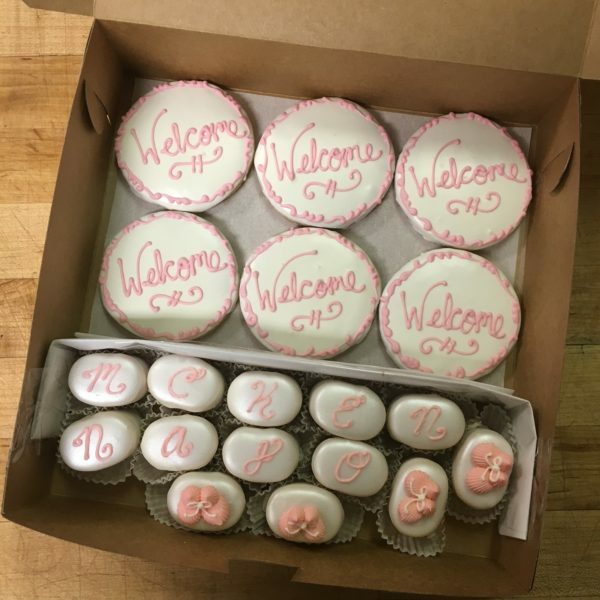 Those are 6 decorated sugar cookies, and 12 traditional petite fours. Customers can customize boxes with different sweets. We have cookies, brownies and of course French macaroons! We made one of our favorite cheesecakes this week, just for us to enjoy at lunch. 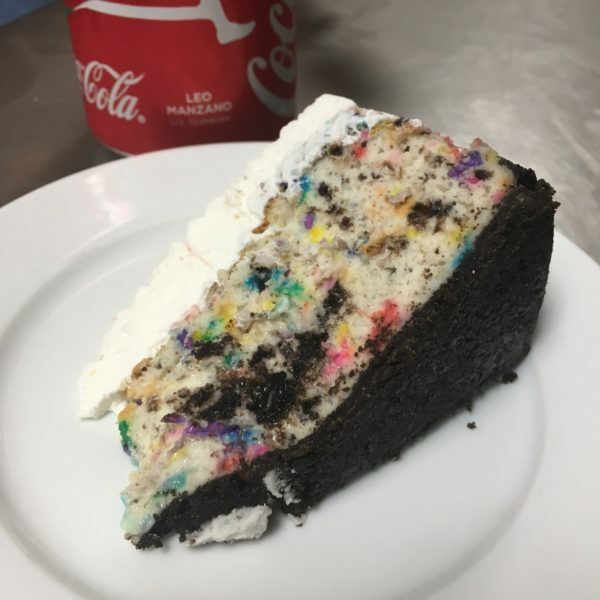 This is our funfetti oreo cheesecake. That’s a sprinkle and oreo cookie filled cheesecake, with an oreo cookie crust and whipped cream on top. What more could someone want? As always, you can keep up with all this by following our instagram, facebook, and twitter! We also are constantly updating our pinterest, both with cakes we make and cakes we love! And of course, call or e-mail anytime to get an order started. Coming soon! Check back Monday for more exciting news!